I’ve been meaning to write an Windows Phone app for ages. I even told Brandon Watson that I would. Nick pointed me to the Windows Phone 7 Social Viewer Application Template that Nick Randolph and Dave Glover had put together. The Social Viewer template is a Visual Studio template that allows you to jump start the development of a Windows Phone 7 application. It provides the foundations of an application that can aggregate multiple RSS/Atom feeds, Facebook and Twitter. I downloaded the zip file, looked over the documentation the guys had put together, and then I got started. First, I got the tools installed onto my Samsung Series 9 laptop. Next, I fired up Visual Studio, opened up the Social Viewer App Template and got coding. Then I got my kids involved to design the app icon. 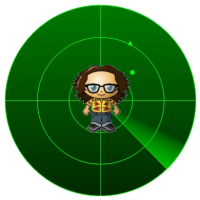 Emma suggested I put “Tech Frank” onto a radar image – so off I went. I futzed with Paint.Net for a while trying to get the image just right. Dave was right – the icon is the thing that took the longest time! Bill gave me a few pointers and voila – application icon created! Enjoy!! Who knows, you may find FrankArr in your neck of the woods! MIX11 or as I like to call it MMXI! I made the long trip to the Mandalay Bay Resort in Las Vegas, which is where MIX 11 is being held this year. It should be a good one this year – the sessions look great and the keynotes are not to be missed. I said it before, and I’ll say it again – the team missed an opportunity to play with the name with some good old fashioned roman numeral hijinks.